Detectives are releasing a CCTV image of a man they would like to speak to in connection with a robbery. The incident happened on Thursday 4 April at around 10:30pm on St Andrews Road in Huddersfield. The 23-year-old male victim was walking on St Andrew’s Road when he was approached by two suspects. The suspects stole the victim’s wallet before making off on foot. 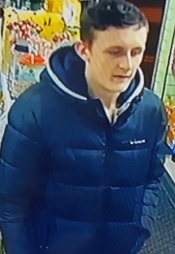 Detective Constable Ian Carruthers, of Kirklees CID said, “We are investigating this incident and would like to speak to anyone who can identify the man pictured the image who we would like to speak with in connection with the robbery.